I wish The International Group for Historic Aircraft Recovery all the luck in the world in its search for the remains of Ms.
Earhart's remains and those of her navigator Mr. Noonan and of the Lockheed Electra they were flying. I hope they are able to finally solve one of avations greatest msyteries. Wow that was a monumental effort Rick! Keep up the good work...lol! Why after this many years does it matter what happened to her? I wish they would spend this much time and money looking for all the missing children in America. Dumb. It's not the US doing these searches. It's just one group of people – The International Group for Historic Aircraft Recovery. International meaning people of more than one country involved. The international group I doubt is responsible (as a group) to help police or FBI search for missing children. And...the group uses their own money in their research. "Discovery News reported that the group has determined 57 “credible” radio transmissions from Earhart after her plane went down"
Please explain this to me – 1) how is it possible to know that after all these years, exactly 57 radio transmissions were made? 2) how were they recorded? 3) who makes that determination of credibility, and why? 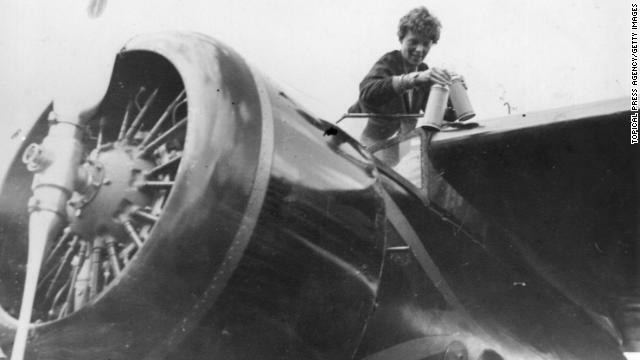 These articles on Amelia Earhart leave just about everything to be desired in the way of information. If the research group in question cannot inform the press of the pertinent information, then I humbly suggest that the IRS review their finances, because something does not seem right, at all. Simple, all radio transmissions received by the Navy and Coast Guard are logged. With the radio direction finders that were available in the '30s, it was relatively easy to triangulate the direction a transmission came from. If it came from a direction that was nowhere near the plotted course, it was considered "unreliable", possibly due to atmospheric "bounce". At that time, It was, quite possible to not receive a message that was tansmitted from a relatively short distance away, but receive a message that was transmitted halfway around the world. You need to spend more time studying geography. The Bermuda Triangle is near the island of Bermuda, in the Atlantic Ocean, thousands of miles from where Amelia Earhart disappeared over the Pacific Ocean. Some time learning to spell English would be well spent as well. This web site has helped me so much over the past couple of mouths and thank you for all of the info. Earhart news is always tantalizing, and for 76 years, consistently disappointing. We've been reacting to false alarms and failed theories about this poor pair's disappearance for ages. Much as I love a mystery, when it comes to Earhart, I wish we'd stop hearing about it every time a research group identifies a nondescript sonar blip, or, as in this case, a really smart (but ultimately conjecture-based) re-evaluation of existing records and files. One wonders why so many researchers are content to simply join the legions of prematurely celebrating Earhart-hunting losers. Turn up a positively identifiable piece of wreckage or carry home an igloo cooler full of conclusive skeletal evidence before announcing your triumph, for a change. IIt is nice to hear a theory about her landing and not crashing and dying, gives an image of her living to a possible old age; even if it is on a deserted island. A little hope no matter how false it might be. MENTAL DISORDERS COMPLAINT ON POLITICAL AND CHILDREN . Examined each GENOCIDE PROJECT OF PERSONALITY CHARACTERISTICS FROM THE POINT OF VIEW OF THESE CRIMINAL REPORT . NEW URL IN CRIMINALISTIC INVESTIGATIONS. think she ran off with jimmy hoffa?